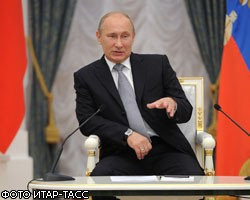 President Vladimir Putin believes the Russian economy will be able to withstand an eventual economic crisis, arguing that the country ranked third in terms of economic growth rates in 2011 and fourth in terms of industrial output growth rates. “The economy is generally in good shape right now and we’re confident that should a crisis break out we have what it takes to deal with it,” the president pointed out at a meeting with regional human rights commissioners. “Public debt is minimal at 10%, the unemployment rate is slightly above 5%, which is below the pre-crisis level,” he argued, adding that anti-crisis measures have been enacted and sufficient currency reserves have been accumulated. Putin went on to say that despite a lackluster economic environment on the global markets, Russia will be able to solve its housing issues within the next ten years. “I think we have a unique one-time opportunity to radically improve housing provision in Russia. We have the chance to succeed by committing economic, financial, administrative, and political resources to this objective,” Putin said. Meanwhile, Prime Minister Dmitry Medvedev held a cabinet meeting today on allocating subsidies from the federal budget aimed at creating incentives for the construction of low-cost housing facilities. This RUB 2.4bn (approx. USD 75.35m) program seeks to stimulate construction of affordable, energy-efficient, and environmentally friendly real estate.